The Fifties were anything but fabulous for Frank Sinatra; he was dropped by Columbia Records in 1952, his career in the doldrums. His personal life wasn’t any better. He was divorced by his wife Nancy and attempted suicide in despair due to his tumultuous relationship with his next wife, Ava Gardner. In 1955 he released In the Wee Small Hours, a new kind of concept album, and followed it with Where Are You in 1957, an even starker portrayal of a singer at the end of his rope. In 1958 he rounded out this trilogy of unfulfilled romantic longing with Sinatra Sings for Only the Lonely, his third album for Capitol Records. At the edge of the abyss, in retrospect they represent Sinatra at his introspective best, before he got caught up in the Chairman-of-the-Board bravado of New York, New York and My Way. It is that early Sinatra Bob Dylan celebrates and pays homage to in his 36th studio recording Shadows In the Night. The title is a resonant play on words of Sinatra’s recording of Strangers In the Night. Think of it as Dylan’s Keatsian Ode to Melancholy, or Desolation Row Revisited. It won’t help you make it through the night. Leonard Cohen sounds cheerful by comparison. And yet, as with all of Dylan’s best music, it is not without a slender thread of hope. It demonstrates that Dylan is a great singer and interpreter of others’ lyrics. And unlike his recent concert performances you can understand every word. This is a definitive collection of great American songs, none of which he wrote. And in Frank Sinatra’s Centennial Year, born December 12, 1915, it is no accident Dylan has perfectly timed this close-to-the-bone 100th birthday celebration of the performing and recording artist many regard as the greatest singer of the 20th Century. He released it on the night of a full moon; with the song Full Moon and Empty Arms; there are no accidents, said Freud, and like the title this clearly was no accident either. On the other side of the album, bookending it so to speak, is the sun—as in That Lucky Old Sun—the same one Frankie Laine used to sing, and in between are star-crossed lovers (I’m a Fool to Want You, The Night We Called It a Day, Where Are You? and Irving Berlin’s What’ll I Do,) Johnny Mercer’s Autumn Leaves and Rodgers and Hammerstein’s Some Enchanted Evening. Rounding out the set are Stay With Me (the original title by Leigh and Moross, which Dylan performed live as the final encore in his Sunday concert at the Dolby Theatre last October 26th) and my personal favorite, Why Try to Change Me Now, the last song Sinatra recorded before leaving Columbia Records in September1952, a lament for his own artistic freedom. For an artist who has sometimes been criticized for being casual with album credits when it comes to borrowings and adaptations from traditional sources, Dylan made sure that each song on this record is meticulously sourced. That’s part of its charm, as it was part of Sinatra’s charm as a live performer. If you think you’ve heard these songs before, you haven’t; Dylan—sounding like a strange, ghostly echo of himself—sings them with a heartache and quiet desperation that will haunt your nights and disturb your dreams. It’s a broken man contemplating the end of his life and unfulfilled romantic longings that belies the eminently successful singer-songwriter who has given command performances before the Pope, a pater familias with five children and grandchildren, and habitué of a Malibu mansion who has just been honored by the National Academy of Recording Arts and Sciences as Person of the Year for his charitable contributions to Musicares on behalf of artists who have fallen on hard times. The artist is his inner life, not the public man, or family man, or businessman. Only the artist is allowed in the studio. Who is he kidding?—Bob Dylan as the lonely outsider; the unsung outcast, unloved, abandoned and alone? That is the quintessential voice of this album, and either he should get an Academy Award for Best Actor or a Grammy for Best Vocal Performance by an aging superstar. I’ve said it before, but I’ll say it again: America’s greatest songwriter has laid down his pen and inhabiting entirely the words of others has painted his masterpiece. This album of ten love songs recorded at various times by Frank Sinatra and associated with mainstream show business venues like Broadway and Las Vegas has found a quixotic, unlikely interpreter of absolute authenticity in the voice of youthful rebellion gradually transformed into the voice of aging resignation. Thank God Dylan lived long enough to make this classic album—especially after most critics had already concluded he had made his final record with Tempest. Turning 74 years old this coming May 24, Dylan reached down into the Great American Songbook and found some buried treasures that had not been overdone. The LA Times Randall Roberts described it honestly as “slow as molasses;” listening to it in one sitting is essential; it’s the longest 35 minutes you may ever spend, and you won’t begrudge a single one of them. If he sounds like “a broken-hearted lover with too personal a tale” well, it wouldn’t be the first time. Having once turned folk into rock, at this stage of his career Dylan has turned pop standards into folk—the kind of folk that has all but disappeared from American music—one voice with authority who believes in what he is saying like Billy Graham believed in the Gospel—only this Gospel is the prayer of the human search for fulfillment in love with one true heart. Dylan will never sing a song like Willie Nelson’s To All The Girls I’ve Loved Before—Dylan’s genius as a singer is that he always sings to one person—perhaps that is why he long ago got tired of being “the voice of a generation.” One easily imagines Pete Seeger, for example, singing to “the people,” a voice for the multitudes; one can only imagine Dylan singing to you—all alone in an empty room enfolded by the mystery of life—and death—and love. There is nobody like him—and there never was. The King died at 42; perhaps he could have been this singer; we’ll never know because he didn’t live long enough to find out. On the back of the album, though, we see a photograph that evokes his own ghostly presence; Dylan reading a 45-rpm record label in its vintage sleeve—and with a magnifying glass you can make out the logo—Sun Records—from Elvis’s first recordings for Sam Phillips. 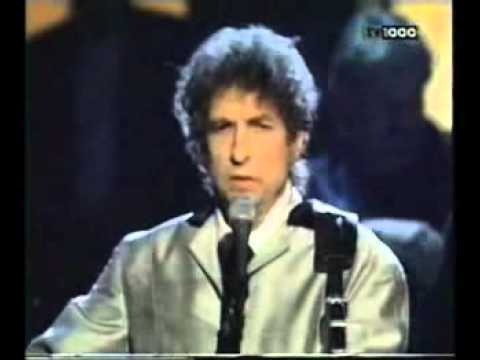 Bob Dylan became this singer; Shadows In the Night is his meditation on the end of life by someone who has not given up on life, but knows how tenuous it all is. It’s sad, it’s heartbreakingly beautiful, and in the end, without the least hint of Sinatra’s swagger and bravado, this is Dylan triumphant. The CD label further evokes the LPs on which these songs first appeared—with a recreation of their standard format “33 1/3 rpm microgroove LONG PLAYING” record labels, a testimony to Dylan’s appreciation for the links in the chain of modern music history—from 33 1/3 rpm to 45 rpm to today’s CD. It’s a lovely visual touch to reinforce the audio recording’s sense of history—which in keeping with this theme was actually recorded in Capitol Records legendary Studio “B” in Hollywood, where Frank Sinatra laid down many of the original tracks, arranged by Nelson Riddle and Gordon Jenkins. Nor is this the first time Bob Dylan has paid tribute to Ol’ Blue Eyes. 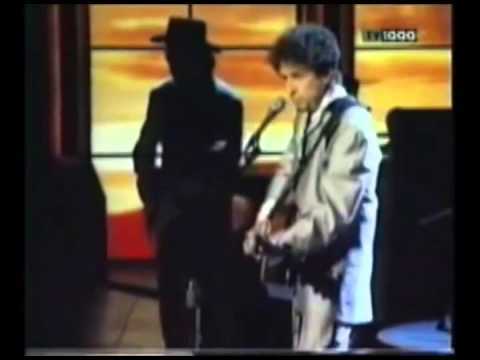 Perhaps you are lucky enough to have seen Dylan’s unexpected appearance on a televised tribute to Frank Sinatra on his 80th birthday December 12, 1995. All the other performers on the show—like Tony Bennett—looked like they belonged. They came out of the same musical milieu as Sinatra, Tin Pan Alley, the Great White Way, the movies or the juke box, or even, as Sinatra described himself, “a saloon singer.” Dylan came out of the Greenwich Village coffee house, the Beat poet’s smoke-filled room, the civil rights and antiwar movements and the Newport Folk Festival. He didn’t belong. And he stole the show. The producers knew what they had; Dylan closed the program with a moving testament to what Sinatra had meant to him and revealed for the first time his influence on Dylan’s own singing. While everyone knew about his debt to Woody Guthrie, and the Delta blues, and even the English and Scots ballads, no one understood that Dylan recognized Sinatra’s greatness as a singer even though they came from two different worlds. What did Sinatra teach him?—in a word, phrasing. Dylan realized that it wasn’t just Sinatra’s vocal gifts that made him a great singer; it was his ability to inhabit a song, to bring a character to life, and above all how to phrase a lyric. Then Dylan sang his closing song from The Times, They Are A-Changing—with an acoustic guitar accompaniment—Restless Farewell, his existential adaptation of an old Irish farewell song. Then, the most moving moment of the night, and again the producers got it so brilliantly right, the cameras left Dylan and panned over to Sinatra’s intensely involved face just in time to see his eyes mist over. Sinatra understood Dylan, just as Dylan deeply appreciated him. Who knew? The voice of one generation had been speaking all along to the voice of the following generation—without even realizing it. This classic album—Shadows In the Night—which Randall Roberts rightly called an American hymnal—is Dylan’s benediction on that singular night—his way of paying lasting tribute to the musical influence nobody knew about until Dylan pulled away all the masks and indirection and metaphors and told them so—in plain English. That is the heartfelt voice on this album—which embraces the great songwriters who preceded him, and the one great singer who paved the way. But the achievement is not Dylan’s alone—his great band creates the musical soundscape surrounding Dylan’s voice, and they are amazing. My recording engineer Scott Fraser took a line from Renée Zellweger: “They had me at the pedal steel guitar.” Before Bob sings a note Donny Herron sets the mood with that slow, languorous introductory progression—smooth as silk—the perfect background to Dylan’s instantly recognizable aged-in-the-flask-barely-heard-above-a-whisper-clearing-his-throat voice, “I’m a fool to want you,” and then, to make sure you get it, “I’m a fool to want you;” a song co-written by Sinatra and pure gold. For the first time in 36 studio recordings all Dylan does is sing; no guitar, piano, or harmonica. By that of course he is referring to the way in which they were first recorded—arranged for an entire orchestra—with which Dylan’s five-piece band could not hope to compete. But that was not a disadvantage; that was the whole point—to make each note count and make the songs as exposed as the singer who inhabited them. “How can we know the dancer from the dance?” asked Yeats in Among School Children; in Dylan’s versions, you can’t; the singer becomes the song. It’s a brilliant reduction. Dylan said something else in the interview that was striking: “There are some things best left to the young—like passion; if you try to imitate that at this stage of life you can really hurt yourself.” “That is no country for old men,” Yeats also warned, in Sailing to Byzantium. Words of wisdom—hard won, from an old master. The 60’s may be over, but to my mind we are still listening to the voice of a generation, a sadder and a wiser man, as Coleridge’s Ancient Mariner ruefully observed. As always, Dylan did Sinatra his way. One final note: Columbia’s A & R man Mitch Miller (of “Sing Along With Mitch” fame) objected when John Hammond signed the young Bob Dylan to the label, saying he “just didn’t belong” on the same label with Billie Holiday and Frank Sinatra. Little did he know; somewhere Mitch—behind that goatee—is smiling.